Always day-dreaming of endless summers and living by the beach? No matter what your location, you can bring that seaside feeling into your home. As summer is in full swing, many of us dream of living by the coast. With the fresh sea air, long walks along the beach and the sound of the sea – it’s a world away from our fast-paced everyday lives. 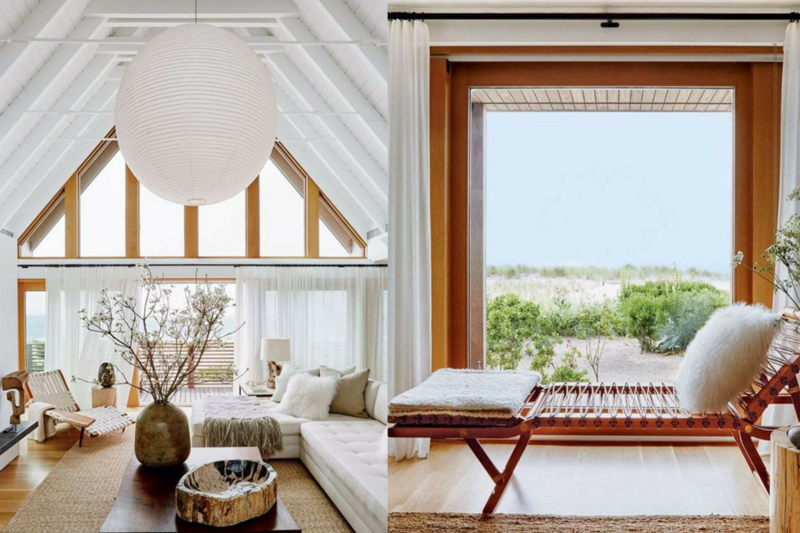 Whether you’re lucky enough to live at the beach, or just like to retreat there in your mind, a beach house should encourage relaxation by embracing and reflecting its natural surroundings. Think beyond nautical motifs and classic navy and white stripes: this is how to do coastal chic. 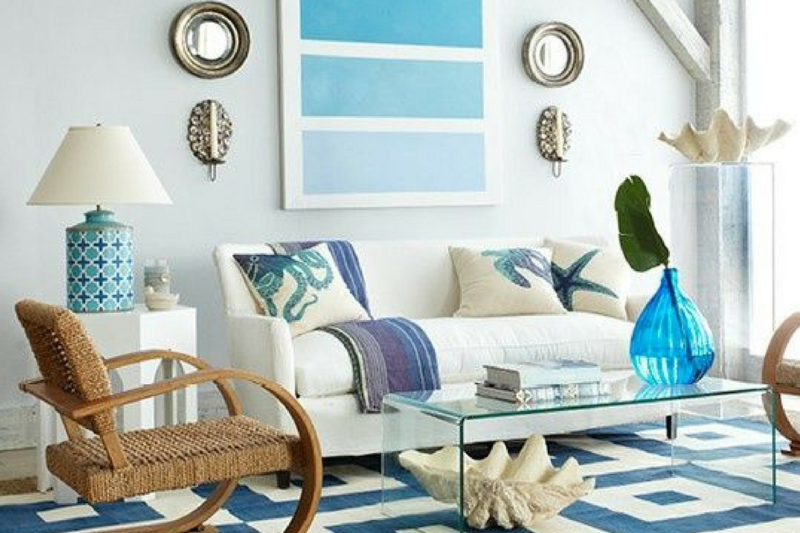 These 9 tips will help you give your home a chic, coastal look in no time. The possibilities are endless when you use the ocean and coastline as your inspiration. Coastal chic is a perennial favourite choice among designers and home owners. The relaxed and fresh style reminds us of those lazy summer days or that exotic holiday trip when sun, sand and surf were just a stone’s throw away! Bringing the bright, beautiful and energising aura of life on the beach, coastal style is all about creating a relaxing, airy and cheerful atmosphere indoors. 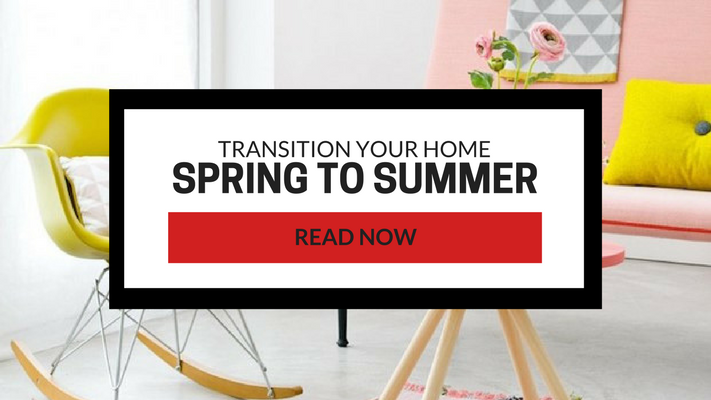 While there are several different versions of the beach-inspired theme, it is best to pick one without the clichés that serve you well all year round. Like the beach itself, coastal rooms should feel breezy, so don’t stifle them with a surfeit of furniture. Decorate with an eye to maintaining clear vistas and sight lines — accent the periphery of a space rather than clogging its centre. For the open plan space to flow naturally, it is important that there is a consistency to the decoration. Keeping the colour scheme neutral provides an easy backdrop to work with. Neutral doesn’t mean colourless, though. 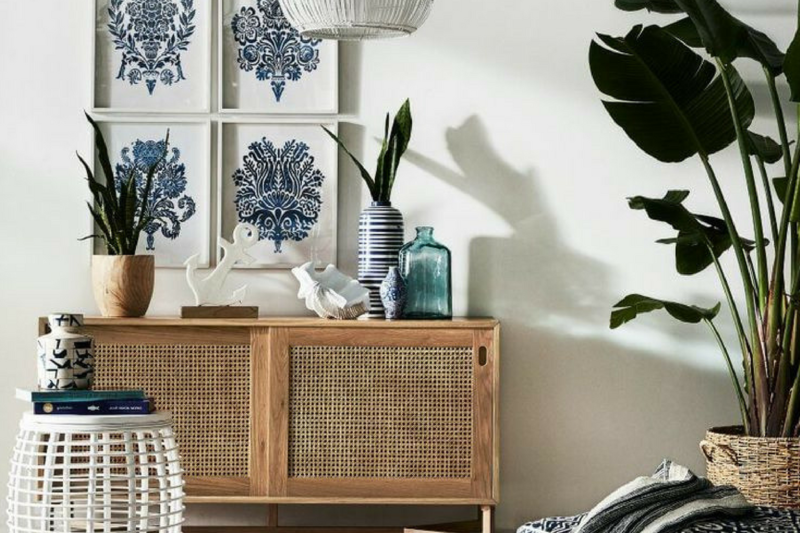 Whether you opt for a soothing colour scheme or a tropical pop of colour, make sure the layout of your home makes it easy to create a breezy and open space to embrace the coastal life. There’s something enchanting about a completely white room; it has an immediate calming and relaxing effect. So, white tones work perfectly to create a cool, calm backdrop, allowing your colours to pop in a subtle way. Pure white towels, crisp sheets and even sheer curtains have a built-in beach look, and it will automatically make your home feel clean and sunny. Airy, refreshing, and invigorating, white elements such as walls, bedding, and furniture will illuminate your coastal look and provide the perfect foundation for ocean-influenced accents. Incorporating large amounts of bright white into the décor compliments the cool blue and warm wood tones in the other design elements and makes the entire look, cohesive. Life on the beach is all about soaking in the sunshine and if you are decorating with a coastal look, the light is the single most important factor. There is no substitute for great natural light in creating interiors that are open and cheerful. The light hues further amplify light to create a lively setting. 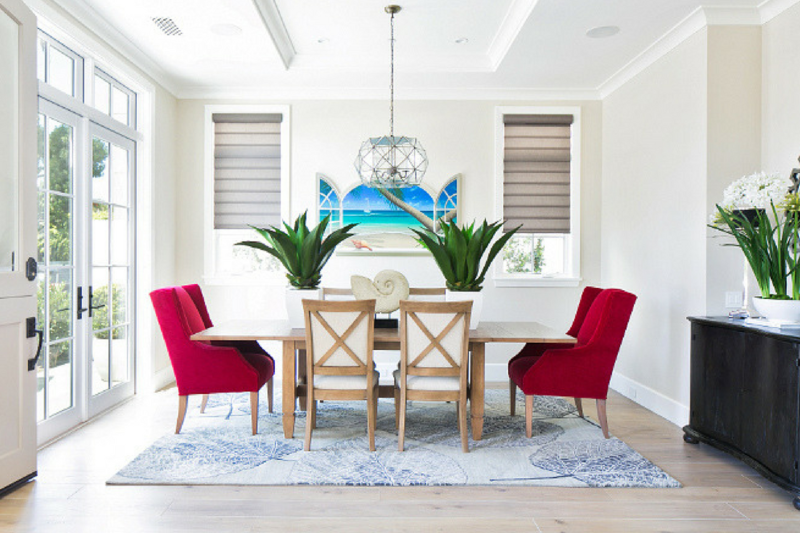 One of the easiest ways to provide a coastal vibe is to open up your windows and let the natural light in. Replace heavy curtains with soft sheers, which can move with the breeze. Position key pieces of furniture near windows so that the space is flooded with light from sunrise to sunset, allowing you to admire the view. Choosing furniture for a coastal style room can be loads of fun. Décor crafted from natural fibres and organic materials serve you best in accentuating the coastal theme further. Home decor should enhance the room, with each piece alluding to the location and adding character in the process. Shells and coral gathered make wonderful vignettes on a console or sideboard, but if you don’t happen to find anything, cheat! Pieces made from natural driftwood such as candle holders and mirrors not only blend in beautifully with the coastal scheme but also fulfil a practical function. Wickers tools, rattan furniture and beds with a natural oak frame also fit perfectly into the scheme of things. Add splashes of bold colour to bring that seaside feeling into your home. 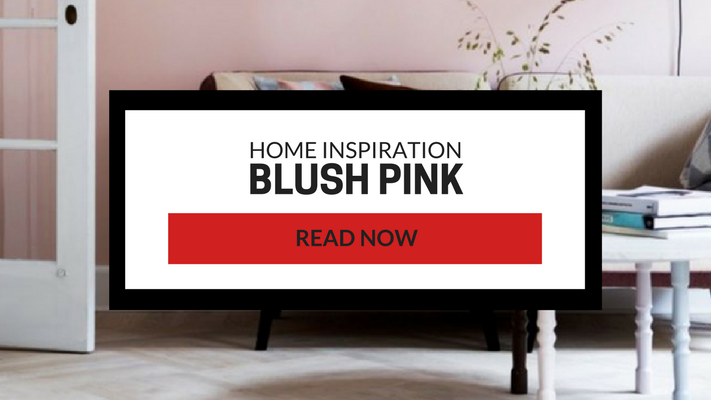 You can introduce your colours through furniture, accessories and other warm-hued pieces. The colour of water and the sky, blue is an obvious choice for beach-area interiors. Consider incorporating muted shades of greens and blues – even the classic navy will work. Only a hint of colour is required; accents in classic coastal shades of blue and turquoise help to bring the space alive. Whilst also giving a subtle nod to the sea and sky beyond. The beauty and the enchantment of your home having a perfect coastal look are the fact that it brings us closer to nature and its soothing abode. Large indoor plants work so well for the coastal vibe as they help to blur the lines between inside and outside. Oversized plants create that island-paradise tropical feel, while the deep greens sit very well with the whites, neutrals, blues and washed greys. Colourful and tropical flowers in large pots add a lush, vibrant look and feel, while still providing some extra drama to the space. By strategically placing an orchid, fern or palm, you are making a bold comment about wanting your home to feel and look like the tropics. It doesn’t need to be a living plant. With the use of architectural planters, the beauty of your home’s interiors can be greatly enhanced. There’s something decidedly preppy and beachy about stripes. So, we would be remiss not to mention how well they work in even the most modern of beach homes. Introduce patterns and texture into your scheme with stripes and checks and cheery seaside-print fabrics. Incorporate them in traditional ways like rugs, pillows, and upholstery, or branch out with striped art, wallpaper, or window treatments. Bold stripes used on upholstery can be complimented with patterns in softer shades. Layering multiple colours and patterns is a good way to achieve the coastal chic style. These include coral, stripes, checks and chevrons or v-shaped patterns. Layer up cushions in subtle washed-out stripes and tactile ribs for casual beachy appeal. What could be better than a luxurious rug for your coastal home? 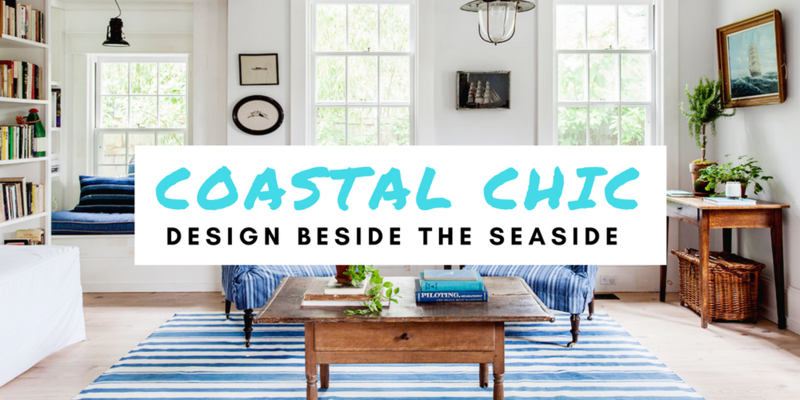 Escape from reality and take your space to a spot by the sea with coastal chic flooring. 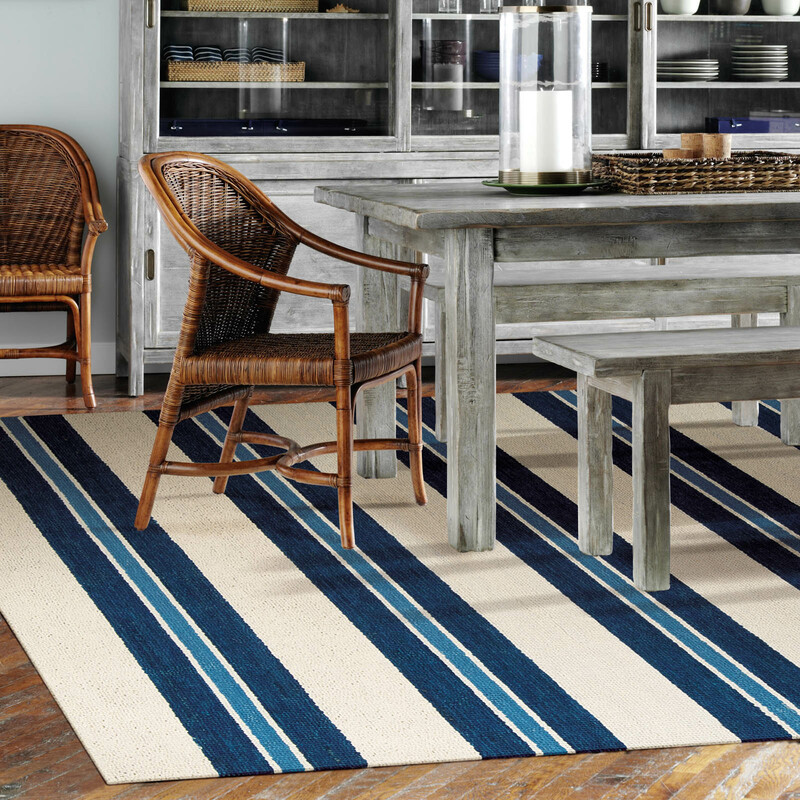 Think coastal living and casual beach house style with rugs so classic they’ll even work in any room. Rugs offer a way to introduce colour and texture. Open-weave rugs in natural fibres work well in any room for the coastal look. Organic materials such as sea grass, straw and jute bring a natural warmth and texture to coastal interiors. Seagrass rugs reign supreme in these chic homes and get a more attainable aesthetic through area rugs. Sailor Stripes: Wide stripes in royal blue make this versatile rug (it can live indoors or out) a chic choice for a summer house. 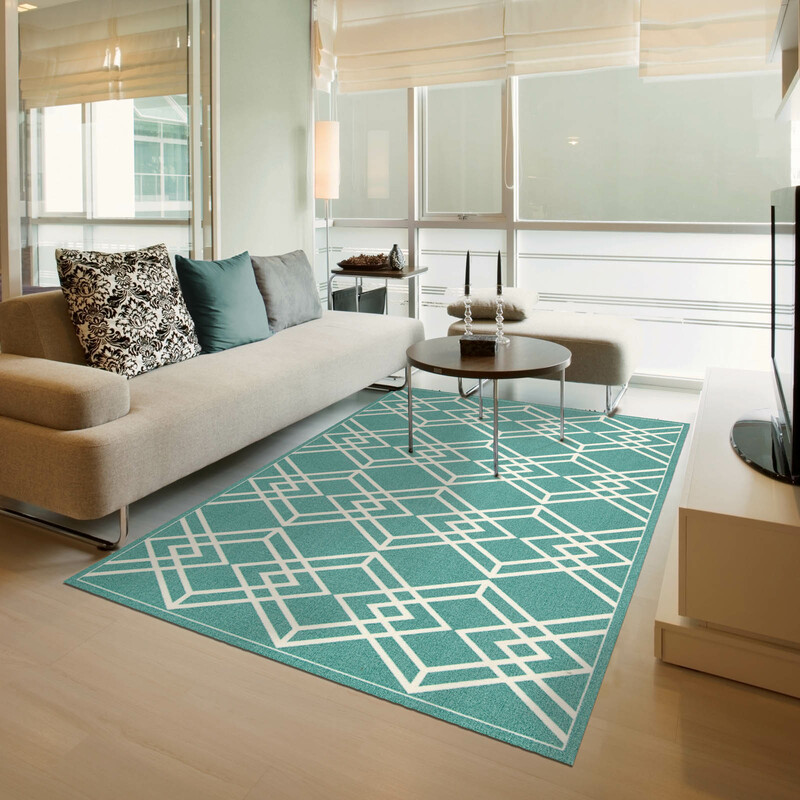 Into The Blue: Because it’s constructed from polyester yarn, this rug can take the weather, and its eye-catching pattern is a winner in our book. 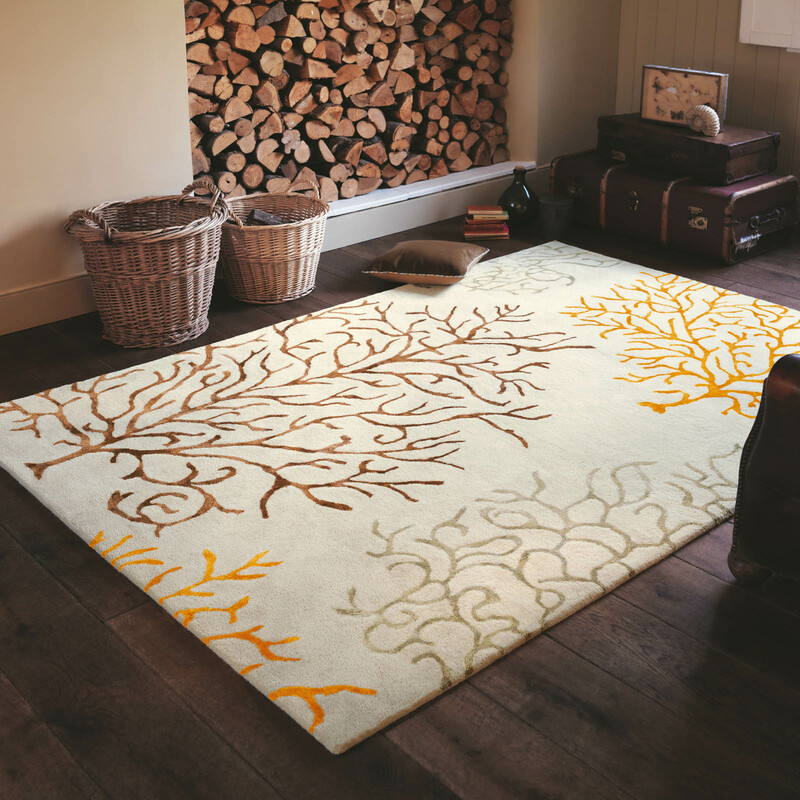 Under The Sea: We love the coral pattern on this 100% Pure Wool rug. It is the ideal coastal accent. 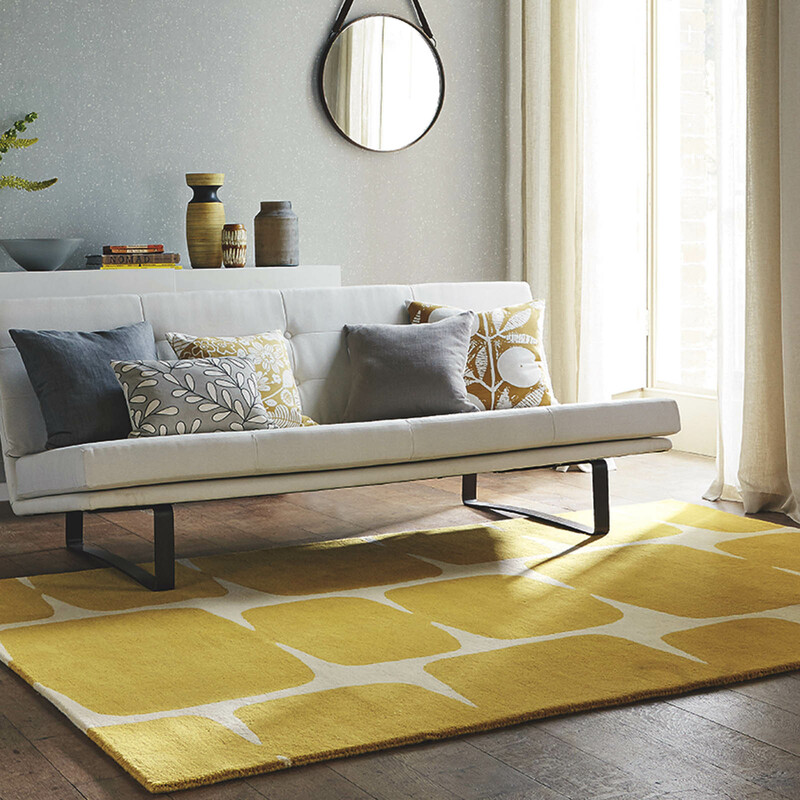 Under The Sun: Made to offer high levels of comfort, this rug in vibrant yellow looks fab on a screened porch or patio. 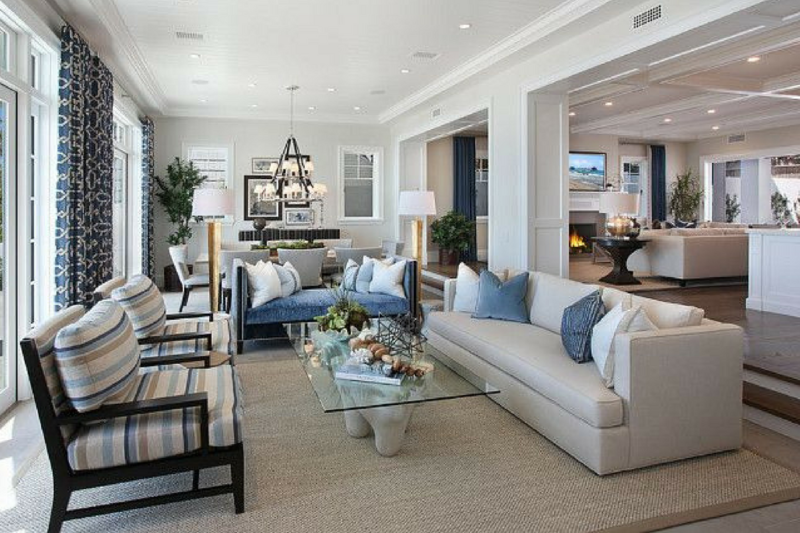 You may think “coastal style” interiors and a few clichés may come to mind. However, you don’t have to go overboard with shells and pieces of driftwood to create the relaxed coastal vibe. Instead, a subtle nod to this style will have more impact on the coastal chic look. Choosing the right coastal décor to add t0 your home can be done with nautical accessories. They can be perfect for styling any room in your house, most popular being the bathroom. 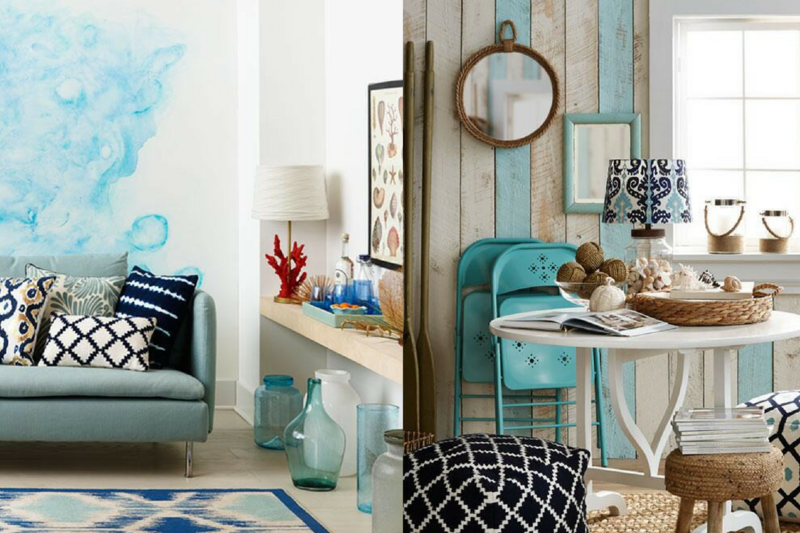 Create an easy-going beach vibe in your home and transform any room into a seaside getaway. With the use of lighthouse signs, doorstops, hanging hearts and sail boats themed accessories. From gentle soft furnishings to totally setting sail with bold stripes, clean white walls, shells and seagulls. The design world is your oyster, literally! Take a look at our Coastal Chic Interiors Pinterest Board for more inspiration on ways to style your home. 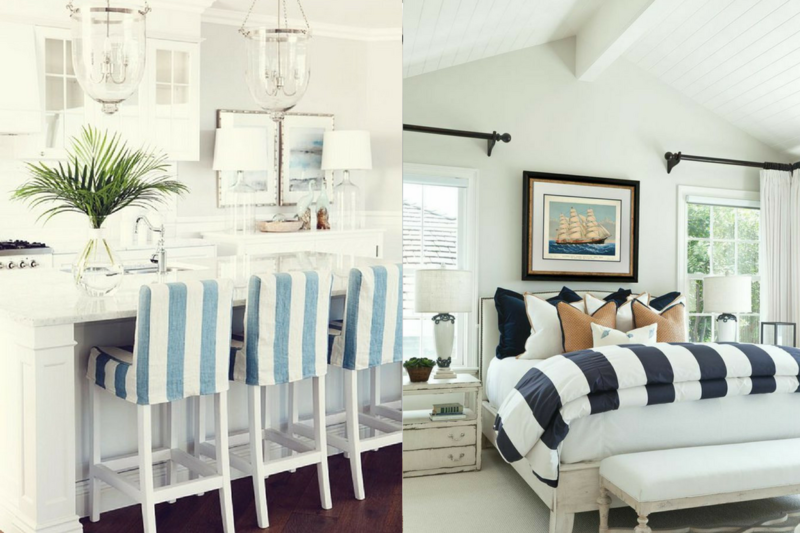 Are you looking to create a coastal vibe or more of a beachy look in your home? Tell us in the comments below, as we’d love to hear your thoughts! Nice article! Adina you wrote really beautiful article about Coastal Chic Interiors I must appreciate your ideas. Thanks for posting this.